Purchase your Sentosa FUN Pass and be all set for a funfilled day out! Learn about the history and must-see sights of Sentosa Island with a 2-hour guided tour! I booked it the same day upon arrival at Vivo City and it's very convenient to claim. You just have to go to the redemption and show your online voucher. Explore Singapore’s famous Sentosa Island in the most efficient way possible — aboard the famous Sentosa Express. 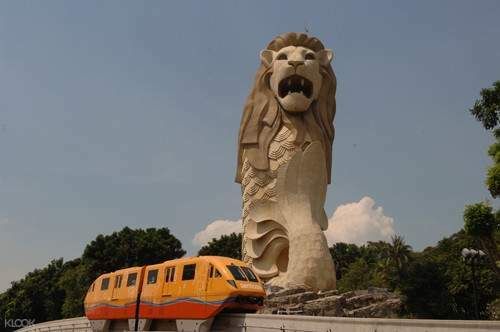 Get from one side of the island to the other in just 8 minutes and hop off at the famous attractions like Resorts World Sentosa, Universal Studios Singapore and S.E.A Aquarium (Waterfront Station), 4D Adventureland and Butterfly Park (Imbiah Station), Siloso and Palwan beaches (Beach Station) and more. Operating from 7am to 10pm on weekdays and till 12am Friday to Sunday, Sentosa Express is a speedy and flexible way to see Singapore. Monorail train is really efficient and frequent. Change the voucher at the counter at Vivo city station and can use the same ticker to any monorail station in Sentosa Island. The miniature of the monorail merchandise is so cute like the Japan train merchandise. So don’t forget to get yours at least one piece!! the scenery of sentosa island during the tour is really reallly amazing and magneficient! So se my photos here.. Monorail train is really efficient and frequent. Change the voucher at the counter at Vivo city station and can use the same ticker to any monorail station in Sentosa Island. The miniature of the monorail merchandise is so cute like the Japan train merchandise. So don’t forget to get yours at least one piece!! the scenery of sentosa island during the tour is really reallly amazing and magneficient! So se my photos here..
Sooo easy buying using Klook. Just have to change the voucher at the ticket counter and you’re good to go. Very convenient compared to when walk from Harbourland MRT. The price is also much cheaper and the view was undeniably superb. Thank you Klook, will definitely buy with Klook again!! Sooo easy buying using Klook. Just have to change the voucher at the ticket counter and you’re good to go. Very convenient compared to when walk from Harbourland MRT. The price is also much cheaper and the view was undeniably superb. Thank you Klook, will definitely buy with Klook again!! Great and ticket was so easily redeemed! The unlimited rides really help older folks get from one attraction easily. If you only have 1 day at Sentosa and you’re skipping Universal, I recommend starting a the Palawan Beach at beach station, then working your way back towards the entrance as the day gets on it’s hotter to be outside. Great and ticket was so easily redeemed! The unlimited rides really help older folks get from one attraction easily. If you only have 1 day at Sentosa and you’re skipping Universal, I recommend starting a the Palawan Beach at beach station, then working your way back towards the entrance as the day gets on it’s hotter to be outside. Don’t book this if you’re going to book the cable car already. We ended up not using this since we opted for the cable. Nonetheless, thanks klook for the hassle free transactions! Here’s a picture of our cable car experience in leu of the train experience! Don’t book this if you’re going to book the cable car already. We ended up not using this since we opted for the cable. Nonetheless, thanks klook for the hassle free transactions! Here’s a picture of our cable car experience in leu of the train experience! 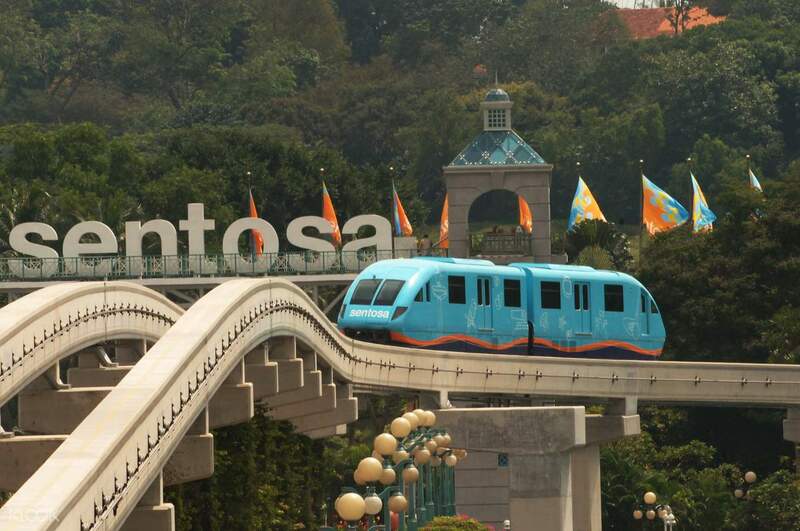 The Sentosa Express Train is a fantastic way of getting to the island. Very fast and convenience way to go around the island and all attractions and also can enjoy a great view. It will took 5 min to get drop in each station. The Sentosa Express Train is a fantastic way of getting to the island. Very fast and convenience way to go around the island and all attractions and also can enjoy a great view. It will took 5 min to get drop in each station. We skip the long queue and go straight to redemption booth. While everyone is patiently lining up. We even booked it on the spot and claimed it on the spot too. Hassle free and a must try to enjoy your singapore sentosa island adventure. Thanks again klook! We skip the long queue and go straight to redemption booth. While everyone is patiently lining up. We even booked it on the spot and claimed it on the spot too. Hassle free and a must try to enjoy your singapore sentosa island adventure. Thanks again klook!